The 1905 Philadelphia Athletics season was a season in American baseball. 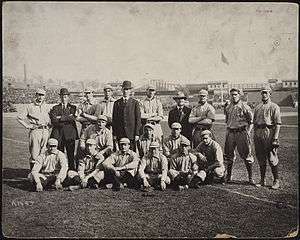 The team finished first in the American League with a record of 92 wins and 56 losses, winning their first pennant. They went on to face the New York Giants in the 1905 World Series, losing 4 games to 1. The pitching staff featured three future Hall of Famers: Rube Waddell, Eddie Plank, and Chief Bender. Waddell easily won the pitching triple crown in 1905, with 27 wins, 287 strikeouts, and a 1.48 earned run average. The Athletics at the Polo Grounds before a World Series game. The A's offense scored the most runs in the league. Slugger Harry Davis led all players in home runs, runs scored, and runs batted in. After New York Giants' manager John McGraw told reporters that Philadelphia manufacturer Ben Shibe, who owned the controlling interest in the Athletics, had a "white elephant on his hands", manager Connie Mack defiantly adopted the white elephant as the team mascot, and presented McGraw with a stuffed toy elephant at the start of the 1905 World Series. McGraw and Mack had known each other for years, and McGraw accepted it graciously.